When it comes to baby sewing patterns, you want to make sure they're soft and sanitary for your little one. 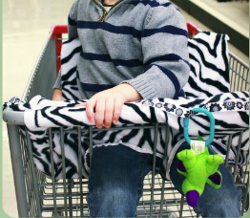 This free baby shopping cart cover pattern will help keep baby entertained while you shop. You can even attach toys to the cart. Let Maureen Wilson walk you through each step towards making this cart cover that will protect your child and make them more comfortable while sitting in the cart. There's also a video tutorial that can be found at the bottom of the page. Cut one yard of fleece into the following pieces. You'll have a total of four pieces: a large 20x26 inch rectangle that will be the Seat & Front, a 20x20 inch square that will be the Back, and two 8x13 inch Side Pieces. It's important that you use fleece, because this project has raw edges and fleece won't fray. We'll start by making slits for the straps on the square Back Piece. Mark 3 inches in from the sides and 2 inches up from the bottom edge. We're going to make these slits about 8 inches long, because some carts have the straps down low by the seat and some have them attached to the top of the back. Make one slit on the left and one on the right. Next we'll add elastic to the top of the Back Piece, so that it will slide over the back of the cart seat and keep the cover from sliding. Add a 1-inch-wide piece of elastic to the top of the Back Piece, on the wrong side of the fabric. It goes on the short end farthest from the slits. Stretch the elastic taut as you sew with a zig-zag stitch. Measure 12 inches up from the bottom edge of the Back Piece, and fold the elastic edge down to that mark. Next sew the left and right folded sides, to create an elasticized pocket area. Use a 1/2 inch seam throughout this tutorial. Wrong sides should be together. Put the Back Piece aside and get out the large seat rectangle. Pin a Side Piece to the left and right long sides of the Seat Piece. Line up the short top edge of the Side Piece with the top short edge of the Seat Piece. Right sides should be together. Sew the long side edges on both the left and right sides with a straight stitch. Now we'll add the Back Piece. Lay the Back Piece face down on the Seat Piece, matching up the top edge. You will be pinning the end without the elastic to the top center of the Seat Piece. (You aren't doing anything with the Side Pieces at the moment.) Sew together with a straight stitch. Your project should now resemble a cross shape. Next we'll pin the top of the Side Piece to the edge of the Back Piece. Fold the Side Piece upward and line the edge up with the edge of the Back Piece. You will only be sewing 6 inches from the seam at bottom, leaving a loose flap of fabric at top that will fold over the side of the cart. Sew the Side Piece to the Back Piece, with a seam that is 6 inches long. This will create a box corner. Now we need to add the ribbon ties. This will allow you to tie the cover onto the cart for extra security. Cut 4 ribbons that are 10 inches long. Fold under the edge of one ribbon to prevent fraying, then pin it towards the bottom of a Side Piece. Pin it along the side edge, about 3 inches from the bottom. The ribbon should be face-up and pointing outward. Sew with a zig-zag stitch. Repeat with another ribbon on the other Side Piece. Pin the other two ribbons to the bottom center edge of the Side Pieces. Again, the ribbons should be face up and extending outward. Line up the edges of the Side and Seat Pieces and sew together the full length of the Side Piece's edge. 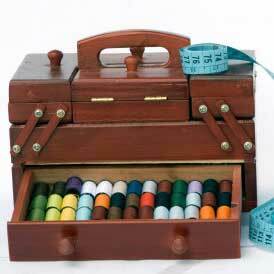 Again, this will create a box corner, with the ribbons poking outward. Carefully singe the ends of the ribbon with a lighter to prevent fraying. Now we'll cut the circles for the leg holes. I made the center of my circle 8 inches down from the seam that joins the Back and Seat pieces. Make the circles rather large for ease of use. Your shopping cart cover could be finished right now, it's basic but functional. However, there are a few finishing touches that will make your cart cover look more professional. Second, you can add Velcro that will wrap around the shopping cart handle. If you don't add Velcro, the flap of fabric will hang loosely over the handle. To add Velcro, cut 3 pieces about 2 inches long, and sew horizontally to the underside bottom edge of the fabric. Add the coordinating Velcro about 3 inches down on the underside of the fabric. Sew these pieces vertically. This will allow you to adjust for variations in handle sizes… Target, for example, has very large cart handles. To use the Super Simple Shopping Cart Cover, slide the elastic over the back of the seat. Tie the corner ribbons, and attach the Velcro around the handle. This shopping cart cover rolls up into a tidy packet. Start rolling from the end without the elastic, then tuck the edges inside of the elastic pocket area. I would never have thought of something like this until my youngest daughter had two premature babies. Suddenly it was super important that their environment be kept as sanitary as possible to avoid infections. A cart cover like this would be a fabulous way of protecting the little ones from the accumulation of germs on shopping trolleys from all the people who handle them each day. And I love the idea of attaching toys and even a Sippy Cup to keep the little one amused. The video says part 1. Where is the rest of it? I had to watch the video then pause it to see the pattern. I would have liked to have had a bit more detail on the pattern.